Tonight, deep in the uncharted hinterlands of the area known as Gungulung in Lake Independence, lots of folks are watching the news on electricity stolen from lamp-posts. It's dangerous and illegal, but for those who have no electricity, and now way to get it legally, it's the only way they can survive. 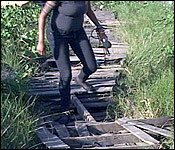 Monica Bodden visited the area and found out how perilous existence in the margins can be:.. It's often an invisible crime - someone illegally hooks into a power supply, hooks up a line or tampers with a meter to avoid recording electricity usage. Quite a number of city residents are culprits - but the impact of electricity theft -including the danger - is often unrecognized. While power theft carries deadly risks - and in some cases thieves pay for the power they steal with their lives - many are willing to take the chance -in instances where there is no other way out. "To be honest I am one of the persons who is taking electricity and it's not because I choose to steal electricity, it's because I have access of having light because I don't have lamp post, we don't have street for them to put the lamp posts." This is the CET Site area -a part of Gungulung in the Lake Independence division. Here, many families are squatting on this open piece of swampy property. 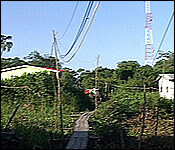 It will take some time for development to be done before power lines can be properly installed in the area. In the meantime - it is being done illegally. 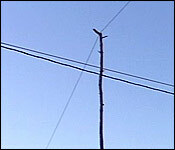 Electrical lines are hooked up on the nearby lampposts by residents themselves. 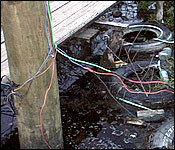 The wires are run on the ground. Some are held up on sticks - that travels all the way to the back. Even extension cords are used from house to house to transfer electricity. "It's frustrating because when it rains, we have problems - the wire burns off and then the place gets flooded and we have kids who walks in the water and then sometimes kids get shock. It's not something that we want to, but we need to survive - we need help." Electricity theft is not just dangerous for those who steal. If you are on the same power line as someone who steals electricity -you could end up paying the cost for their theft too. The power line could become overloaded with electric energy -which could harm electronics and appliances that are designed to receive a certain steady amount of electricity. This is an issue this paying customer -who lives in the neighborhood - has been dealing with for the past 2 years. "For the past two years, I've been getting some very bad experience with the illegal electrical wiring with the residents in the area. We have some squatters around the area that put illegal wiring in the lamp post and a lot of times especially in the rainy season it causes fire on the post. I've called BEL several times and make complain and they said that they will look into the matter, but their workers have been threaten by some of the residents back here. I have a grandbaby that suffers from bronchitis (short of breath) and we have to use the electricity to put him on a machine majority of the times to help him breathe and when the illegal wiring would touch each other and caused fire on the post - knock out the electricity for the entire area and we have to be out of electricity sometimes half day or a whole day. A lot of times when I call BEL they say that they are unaware that the area have blackout - many times. As a matter of fact as late as last week when we have blackout back here and I call BEL, they say that they are unaware that the area have blackout. So I ask them if they can send their workers to come and check and they come and check and they see what the problem is. I went out there and I explain to them. I told them that I am sick and tired of the illegal wiring because me personally, I live in my house, I find that money as a single mother of 6 to put my electrical meter so that I can have my electricity and I believe that the others can do the same. I have been paying between $54 - $59 on a regular basis for the past almost 6 years and after the illegal wiring started on the post my light bill jumped all the way to $131. First it went to $141 and I went in and I fight with BEL: I talk to them and I told them I didn't put anything new electrical in my house and I want to know why my electricity went with that great big jump and they say we are consuming more electricity that we use to. I told her that I plug out everything in my home when I go to sleep at night and leaving the house. The only thing left plugged in is the refrigerator. "We had an experience one day, it was raining and the rain stop and a pit bull dog cross on the wire and the pit bull dog got electrocuted from the wire. 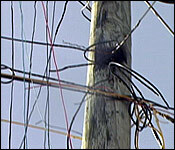 What happened is a lot of times the wires are not connected well and it gives a big ball of fire on the post." And while those are concerns that should not be taken lightly. For these residents it's all about survival mode. And what they must do to provide minimum of comfort life for their children. "I am working, I have a job and I can pay my electricity, but what, we don't have a post that we can go and apply for our meter like everyone else." "How long you've been living in this area?" "To be honest, 8 years." "So this is an issue that you have been dealing with for 8 years?" "8 years. BEL came around the other day and says that they are doing a project, but like right now things went slow and we just have to take out time and see what will happen." "They know that you guys are taking electricity?" 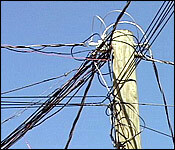 "Yes, the do know because sometimes they come along and take off the wires. We have to do what we have to do. We don't want to put it up back because it's dangerous, but we have to do it - we have kids. I have a little grandson, he loves to play with lighters and matches. Imagine if we don't have electricity? What you all think will happen? We could light candles when we want to. Even if it's not time to light a candle, he will want to and then what will happen? If will lead from no light to no house and then what will happen to us out here? We are already living in swamp, we need to have a life just like everybody else." While electricity is one problem for these residents- poverty is another. 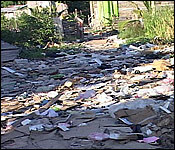 They took me on a tour of what life is like living in a swamp filled with garbage. I struggled to get across these pallets that leads to their houses - An art they all seemed to master quite well. "Actually Monica, that is pallet and it you notice the dirt in the yard, in the swamp - that's filling. 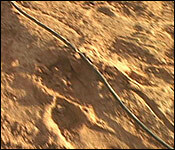 In the future when we get some sand, it will be easier for us to spread because if you notice the dirt is the filling." "Some people might look at the dirt and say that is nastiness, so many dirt. But you guys have to fill the area because it's swampy right?" "Like what our neighbor said, if we don't put the dirt, when you get the clay or whatever, that could balance it - it's like to make it solid. You see it like that, but it's good. It looks much better than before. 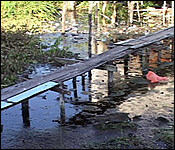 If you notice the other yards are swamp and the water is really high. Monica, please let this known that there are a lot of high school children living in the back of these areas that are attending school and they have homework and different things - it's really hard, so the electricity is really needed. The politician doesn't have time for anybody. They don't want to hear anybody cries. They don't really care about the people, but when election time comes, they will want to walk on your pallet and come for you to vote, but I want they come in my yard, I want the dogs to bite them." BEL Representatives say they are aware of the matter and are taking steps to alleviate residents' concerns and safety hazards in the area. The Company says it will provide details next week.